Life Music Laughter: We'll Need to Work on this Attention Thing. So, I go to visit her and the new dog. He is like a ping pong ball bouncing all over the place! He has an accident, but my mom handles it pretty well. She didn't even get angry with him. Maybe, this isn't so bad. She tells me all about how nice and calm the dog is in the morning when he wakes up, and how when she comes home from work, he is crazy hyper. I tell her "That's because he's happy to see you and wants to play." She says, "Yeah, I know. 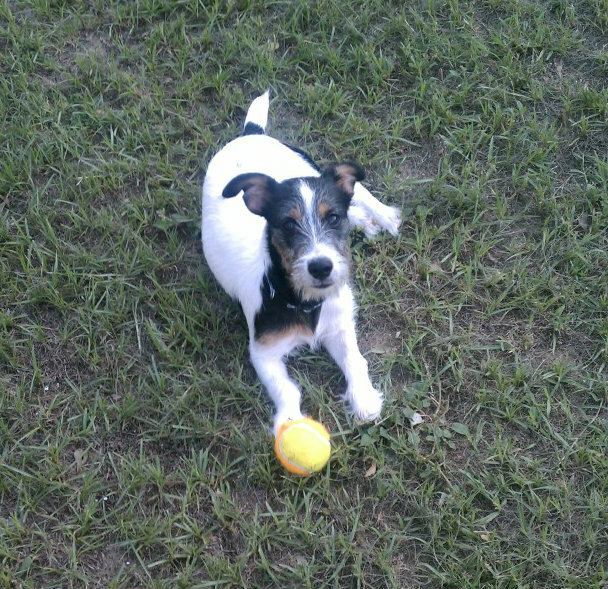 I put him outside and give him his ball. He can play all he wants." We are looking at having to put down our lab mix soon. Her quality of life is just not great. I'd like to have another pet but I do NOT want to headache of a puppy. Mercy...a Jack Russel? Heh...that like a wind up toy on speed! JR's are known for that indeed.